Natural England’s March 2016 EPS mitigation licensing newsletter makes reference to great crested newt eDNA and degradation control but not everyone holds a degree in molecular biology. So what is the degradation control? And why is it important labs do this correctly when testing for newts? 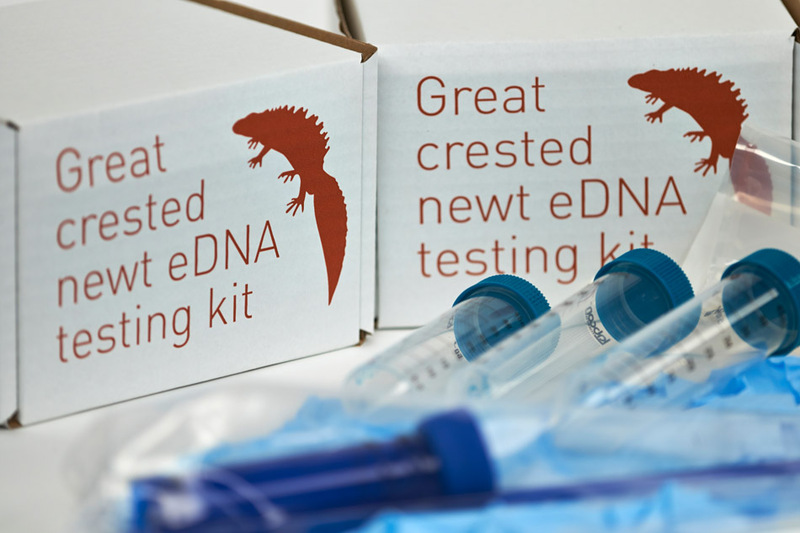 As specified in Appendix 2 of the Natural England Protocol, the degradation control for great crested newt (GCN) eDNA is a piece of synthetic DNA that we add to the preservative (ethanol) in the sampling kits before they are sent out. This synthetic control DNA is purified in the lab on its return alongside the GCN DNA and we test the integrity of it (if it’s still there) using a specific quantitative real-time PCR assay i.e. exactly the same way that we test for newt DNA. It works as a control as the synthetic DNA is essentially subjected to the same conditions as any newt DNA in the pond water collected when you survey before sending your kit back to the lab for testing. If a sample is positive for GCN, whether or not the sample is degraded is a moot point, as it wasn’t degraded enough to stop us detecting newt DNA. The degradation control becomes important with a negative sample. When degradation is detected in a negative sample, newt DNA may have been present, but has potentially been degraded to the point at which we can no longer detect it. On the few occasions this occurs we have to issue an ‘inconclusive’ result. If we didn’t, this could lead to a development going ahead without the proper mitigation, potentially destroying great crested newt habitats and putting a population at risk. There are potentially other ways to test for degradation (e.g. visually assessing fragmentation of DNA) which are not appropriate for evaluating environmental DNA. As a result anything other than a degradation control as appears in Appendix 2 of the Natural England Protocol would not stand up to enquiry. Natural England’s validation data is for this method alone, and is the reason kits have a limited shelf life (the protocol states the kits will only last for “about 2 weeks”), to preserve the integrity of the degradation control DNA. The inhibition control is again a piece of DNA that we test for in the presence of the GCN DNA sample and is added on return to the lab. If inhibiting substances are purified from the pond water along with the DNA these substances will impact the detection of this inhibition control DNA. Again we test for inhibition using a specific quantitative real-time PCR assay (just like for newt test). If detected in negative samples, inhibition will result in the return of an inconclusive result as the GCN test may have been inhibited by these compounds collected during sampling. These inhibiting compounds are only found in a small number of ponds and at this point it’s impossible to predict which ponds will cause problems, hence it is vital this control is performed correctly to monitor this rare effect. In addition to inhibition and degradation we also use positive, negative and extraction controls with every sample we test to ensure the test performs as it should. Our positive control checks that each analysis can detect newt DNA at the amounts present in ponds (if it’s there) and a negative control to ensure a negative comes up a negative i.e. there is no contamination. Extraction control allows us to validate that the DNA extraction phase of the process is working. Controls are important to ensure that the test being performed is providing data of the highest quality and with performance on a par with when Natural England validated the method back in 2014. Hence to protect newts and their habitats it is critical that these controls are performed as described in the technical guidance note provided by Natural England. If degradation and inhibition is missed, newt DNA and hence active populations of GCN will go undetected and developments will go forward without the proper mitigation. The integrity of the fledgling eDNA industry but also that of ecological consultancies and the interests of their clients are at stake.